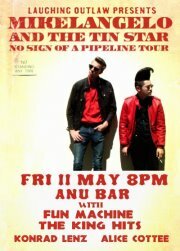 Mikelangelo and the Tin Star will be making a much-awaited appearance at the ANU Bar in Canberra on Friday 11 May 2012. The night before, Mikelangelo joined Bill Quinn on Nikolai Blaskow’s Disc Drive show to chat about the gig and many other things. Click the link to hear the interview and get all the links to all the support bands. That’s the official video, and a lot smoother than the very rough one I took on a dodgy camera phone last year at Tilley’s. My version DOES however feature a Go Girl Gadget Go dancer falling into the front row, so there’s that! CORRECTION: the pitching into the front row was on a previous track. No Go Go dancers were harmed in the making of this video clip. See you at the ANU Bar.